Each year, the UpCity Excellence Awards are presented to the top 1% of marketing service providers in the UpCity marketplace. The awards celebrate the providers with the highest customer satisfaction and brand integrity based on their UpCity Rating, a proprietary scoring mechanism that helps to determine an agency’s “recommendabilty” to businesses looking for marketing service providers. Read more about our Excellence Awards research and methodology. As a marketing service provider, getting noticed can be challenging. In such a crowded industry, identifying the signals that make you recommendable, and, ultimately, bring you new business, can be the key to your success. At the same time, this industry oversaturation presents a challenge for business owners seeking a marketing service provider as well: it’s hard to know who to trust to deliver the highest quality work. That’s where UpCity comes in. UpCity is an online marketplace for businesses to identify the best marketing service providers for their needs. Launched in 2015, we’ve worked hard to build a methodology and rating algorithm to give business owners the tools and intelligence to research great providers in their local area, and to make it easy for those business owners to procure the services they need quickly. The UpCity Marketplace features profiles on over 33,000 marketing service providers in more than 23 verticals across 619 cities in the United States and Canada. With over 7,385 specialized lists currently live (and more always on the way! 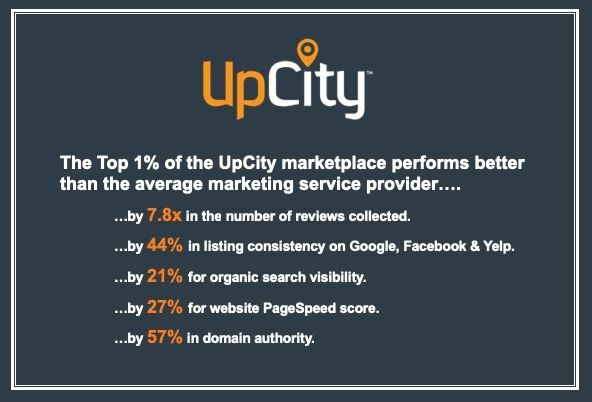 ), it’s no wonder why more than 225,000 businesses visit the UpCity Marketplace on average each month to find the best service provider for them. What Is the UpCity Rating? The UpCity Rating algorithm utilizes signals and indicators like number and quality of reviews, website performance, and domain authority to gauge a service provider’s recommendability and help businesses find the best fit for their needs. The UpCity Rating is an assessment of how recommendable a service provider is in comparison with other service providers. It is derived from a variety of data points that are designed to help business owners find a partner that is the best fit for them, with the goal of giving business owners peace of mind knowing they are partnering with someone they can trust. A service provider’s UpCity Rating helps guide us in ranking and recommending the top service providers by marketing discipline in each local market, providing business with a trusted resource when selecting a provider for their marketing needs. The UpCity Rating also provides us with the data required for the annual UpCity Excellence Awards, honoring the top 1% of agencies across the United States. UpCity Ratings cannot be purchased, and rely solely on factors that impact how recommendable a service provider is. How Is the UpCity Rating Calculated? UpCity Profile Completion: UpCity lists over 33,000 service providers across the country. Each profile highlights nearly 40 data points on each agency, including services offered, target markets, price points and more. UpCity Engagement Rate: Engaging in our marketplace community of over 6,000 active providers increases a service providers’ chances of getting recommended. UpCity Reviews: The reviews on UpCity provide an in-depth view of how a service provider’s customers feel about them and their services. This customer feedback is a key component to how likely UpCity is to recommend a provider to businesses in the marketplace; with our 5,000+ reviews capturing specific feedback, the UpCity rating algorithm takes into account both quality and quantity of reviews for each provider. Third Party Reviews: Reviews on third-party sites like Google My Business, Yelp!, and Facebook also give UpCity a glimpse of how customers feel about a given service provider. The UpCity rating algorithm utilizes over 60,000+ third party reviews to determine the providers with the best online reputation (in terms of both quality and quantity). Presence in Search Engines: This signal measures how prominently a service provider ranks in search engines and is a good indicator of overall authority and domain expertise. To this end, UpCity is tracking over 40,000 industry-specific keywords to determine which providers have the best SERP visibility across 500 cities, 20 specialties and over a dozen verticals. Distance to City Center: Similar to Google Maps, the UpCity Rating algorithm factors in how far a provider’s physical office location is from the center of their city or town. Business Location Data: We confirm that contact information in local listings sites like Yelp!, Google My Business, and Facebook is consistent with a provider’s UpCity profile. We current track 10 data points for over 33,000 service providers to understand how well represented they are at the local level. Domain Authority: The UpCity Rating algorithm utilizes Majestic’s Citation Flow metric as a predictor of how much authority a given service provider’s domain has in the eyes of Google and others. We then take this metric and statistically normalize across our marketplace to determine which providers have the highest domain authority. Website Speed & Experience: The speed of a provider’s website can have an impact on a prospect’s first impression of the business. Tools like Google's PageSpeed Insights provide the UpCity Rating algorithm with key information on a site’s usability and speed, allowing us to reward the providers with the fastest, most usable websites.